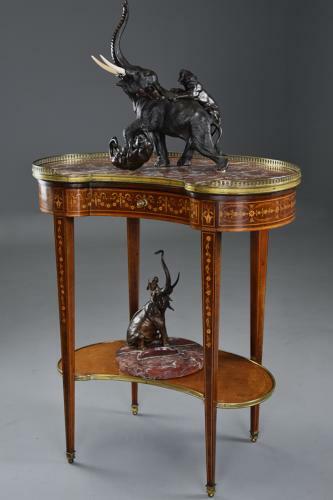 This table consists of a kidney shaped rouge marble top with a shaped and pieced gilt brass gallery leading down to a shaped rail with drawer below, the drawer finely inlaid with satinwood ribbon and floral decoration with satinwood and boxwood stringing, the drawer with a gilt brass knob handle and oak lined. The shaped sides consist of inlaid satinwood harebell decoration, the shaped back also inlaid with satinwood ribbon and floral decoration, all sides with satinwood and boxwood stringing. To the top of each leg an inlaid panel of floral design then leads down the four tapering legs, each inlaid with a floral and foliate design with boxwood stringing. This leads down to a kidney shaped mahogany lower shelf with gilt brass edging terminating with square gilt brass feet. This table is in very good condition for age, is of stable construction and can go straight into a home. Please note: the bronze shown on some images is for photographic purposes only and is not included in the list price.